White House press secretary Sarah Sanders' appearances at the once-daily briefings have become fewer and farther between. Early in the Trump administration, the regular White House press briefings were must-see TV, getting big ratings for the sparring between press secretary and press. In recent months, though, the briefings have shrunk away to the point at which calling them "daily" would be a severe misnomer. "It's an important forum for the public, and we shouldn't let it go," says Martha Joynt Kumar, director of the White House Transition Project and a political scientist who has sat in on the White House briefings for years. The number of briefings began declining in the spring, falling below levels of the last two administrations at the same point in their terms. It dropped precipitously in the past two months. The briefings have also gotten shorter. In the past six months, they've been about 25 percent shorter on average than in the first year of the Trump administration. And Trump administration briefings were already shorter on average than those in the George W. Bush and Obama administrations. Meanwhile, in recent days, President Trump has been speaking for himself — a lot. For instance on Thursday, he took questions from reporters at two bill signings and held court in the Oval Office with rapper Kanye West as members of the press pool tossed out questions. Twice in the past week, Trump has brought reporters to the front of Air Force One to chat and answer questions, and he has called into Fox News three times. These exchanges haven't involved in-depth discussions of policy. Rather, they've been heavy on politics and breezy commentary on news of the day. But he didn't. Instead, he showed up in the briefing room and fielded the incoming queries. "I just felt like it was a responsibility, and ... sort of a democratic duty in a way," McCurry adds. No one from the Trump White House would go on the record for this story, and Sanders hasn't been to the lectern in eight days, so there hasn't been a chance to bring it up in the briefing. But in an interview that got just as testy as some of his briefings, former Trump press secretary Sean Spicer defends the current White House. "The idea that the briefing is the be-all and end-all and the standard-bearer for the degree of accessibility is rather silly in this age," says Spicer, arguing the press staff answers questions by email and in person and issues statements via Twitter or the press pool. Spicer says that when the briefing became a ratings sensation in the Trump administration, its utility decreased. He says that on the cable networks, it got ridiculous with live shots of an empty podium in the corner of the screen hours before the scheduled start time. That idea met a lot of resistance from the press corps and didn't happen. Fleischer, who was press secretary for George W. Bush, now bemoans the state of the briefing. "The good government, on-paper side of me says, 'Of course there should be a regular briefing,' " says Fleischer. "The realist watching the hostility between the Trump White House and the press corps in both directions says, 'What's the point of the briefing?' There's no news. It's just hostility." It is mutually beneficial, she says, because taking questions forces the administration to hone its policy and message. It's a kind of accountability that Perino says she welcomed. 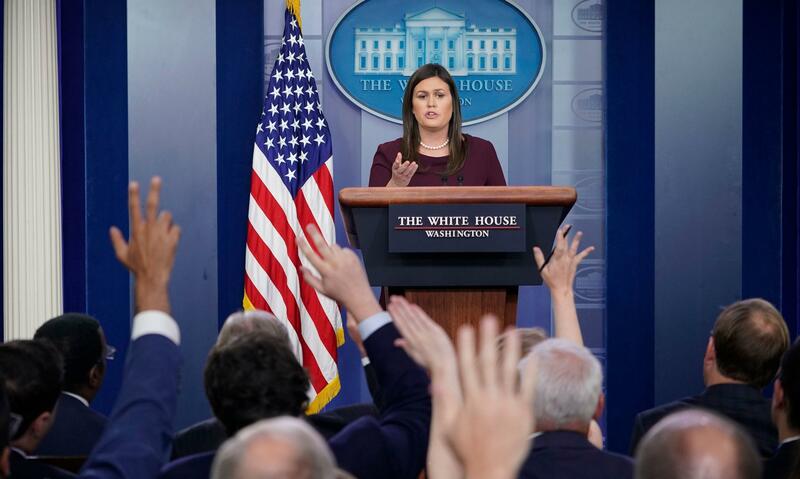 "Internally, when the Cabinet or the staff knows that the press secretary has to go out and answer questions from the press, it can force decision-making or consensus," she says. Early in the Trump administration, the regular White House press briefings were must-see TV for a lot of people. They commanded big ratings for the sparring sessions between the White House press secretary and the media. But in recent months, those briefings have become less frequent to the point where calling them daily would not be accurate. NPR's White House correspondent Tamara Keith has the story. TAMARA KEITH, BYLINE: Press secretary Sarah Sanders last walked up to the lectern in the White House press briefing room on October 3. 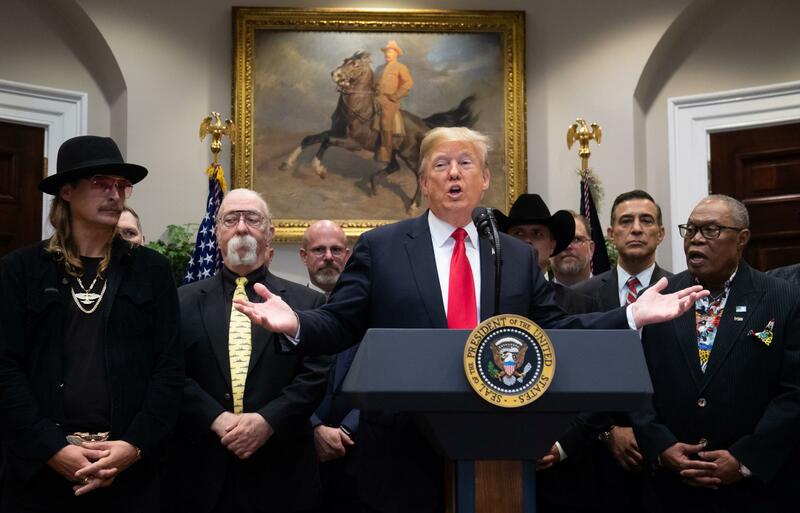 SARAH SANDERS: It's good to see everybody. I missed you. KEITH: It had been 23 days since she last briefed the press. KEITH: Before that, there had been an 18-day stretch with no briefing. MARTHA JOYNT KUMAR: Briefing has clearly fallen off. KEITH: Fallen off a cliff. Martha Joynt Kumar is a political scientist who for years has sat in on the White House briefings. KUMAR: It's an important forum for the public, and we shouldn't let it go. KEITH: The number of briefings began declining in the spring, falling below levels of the last two administrations at the same point in their presidencies. It dropped precipitously in the past two months. The briefings have also gotten shorter, about 25 percent shorter on average from the first year of the Trump administration. Meanwhile in recent days, President Trump has been speaking for himself a lot. PRESIDENT DONALD TRUMP: Any questions, please? Well, this could be your toughest question. KEITH: On Air Force One, on the tarmac, on the South Lawn of the White House, in the Oval Office and calling into Fox News. Mike McCurry was press secretary for President Bill Clinton. MIKE MCCURRY: President Trump thinks, like, he's his own press secretary, and he's the one that ought to be the spokesman every day. And I'm not even sure he likes the idea he's got someone called a spokesman or a press secretary. KEITH: McCurry was Clinton's spokesman during the Starr investigation and other challenging news cycles. MCCURRY: There were many times when I would've been happy to just throw my briefing book against the wall and say, let's just go out and party (laughter). KEITH: But he didn't. Instead, he showed up in the briefing room and fielded the incoming. MCCURRY: I just felt like it was a responsibility and, you know, sort of a democratic duty in a way. KEITH: No one from the Trump White House would go on the record for this story, and Sanders hasn't been to the lectern in eight days. So there hasn't been a chance to ask at the briefing. But former press secretary Sean Spicer defends the White House. SEAN SPICER: The idea that the briefing is the be-all and end-all and the standard bearer for the degree of accessibility is rather silly in this age. KEITH: And he argues that when the briefing became a ratings sensation in the Trump administration, its utility decreased. SPICER: The dynamic and the purpose of the briefing has shifted from reporters using it to gather information to reporters using it to further their own personal careers and name recognition. KEITH: Before the start of the Trump administration, two former press secretaries, McCurry and Ari Fleischer, argued that to turn down the temperature, the briefings shouldn't be live televised events. That met with a lot of resistance from the press corps and didn't happen. Fleischer, who was press secretary for George W. Bush, now bemoans the state of the briefing. ARI FLEISCHER: The good-government-on-paper side of me says of course there should be a regular briefing. The realist watching the hostility between the Trump White House and the press corps in both directions says, what's the point of the briefing? There's no news. It's just hostility. KEITH: He points to exchanges like this one. JIM ACOSTA: Do you have any problem defending the president's comments, Sarah? SANDERS: I don't have any problem stating facts. No. John (ph). SANDERS: I know that's something you probably do have a problem with, but I don't. KEITH: Still, Dana Perino, who also served as press secretary for George W. Bush, says regular briefings have value. The press secretary isn't just speaking to the press. She's speaking to the whole world. DANA PERINO: It is a mutually beneficial thing for a daily briefing to take place. KEITH: Mutually beneficial, she says, because taking questions forces the administration to hone its policy and message. It's a kind of accountability Perino says she welcomed. PERINO: Internally, when the cabinet or the staff knows that the press secretary has to go out and answer questions from the press, it can force decision-making or consensus. KEITH: The question how am I going to explain this to the press can be a powerful motivator. Tamara Keith, NPR News.